Angela is a Licensed Veterinary Technician. She graduated from Macomb Community College's Veterinary Technician Program in 2005 with an Associate of Applied Science Degree in Veterinary Technology. 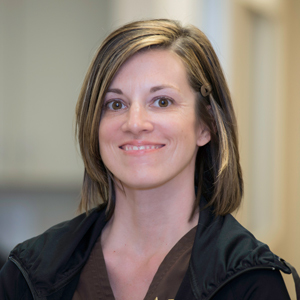 Angela began her veterinary career working as a receptionist before becoming a veterinary assistant and then a certified technician. Angela worked in general practice for 8 years, and for a veterinary ophthlologist for over 10 years. She joined AEC in 2015. "I always loved animals growing up so it was a natural progression to the veterinary field. What I like most is the interaction with clients and hearing how their pets are such an important part of their family, and then being able to help heal their pets." Angela has a 1 year old pitmix rescue. In her time she enjoys spending time with her husband and two kids, taking the family and their dog Leo to the park, reading, going to the movies and doing volunteer work.